On the 27th of April every year, the Netherlands celebrates the King’s birthday. 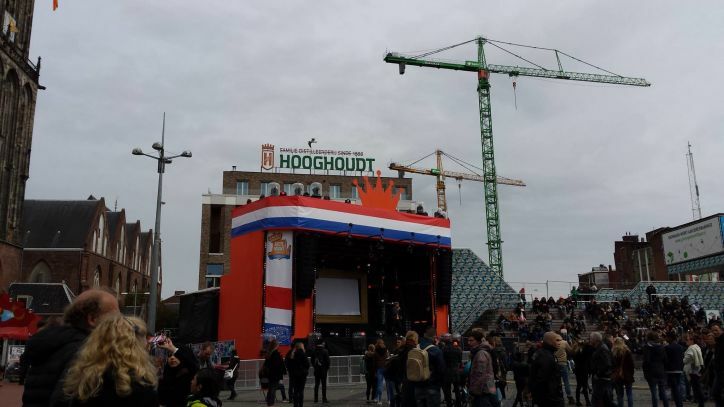 This is known as Koningsdag. It is a national day of parties, drinking and the orange. In this blog, I am going to talk about the celebrations that happens on this day. Who knows, maybe you will learn something new about Dutch culture! King William-Alexander. King of the Netherlands. Koningsdag is the day the Netherlands celebrates the King’s Birthday. It is a national holiday through the country. First of all, the celebrations for the King’s birthday have been in place since 2014 after King William-Alexanders inauguration. Originally, it was called Koninginnedag – Queen’s Day. Koninginneday was celebrated 31st of August 1885 for Queen Wilhelmina’s birth for the first time. The date changed to 30th of April for the birthday of Juliana once she succeeded her mother to the throne. Once the current Princess Beatrix took the throne, she retained the date to honor her mother. The date was only changed in 2014 to celebrate a new era, a new king and a new birthday. To celebrate Kongingsdag properly, it is very normal to wear a wide variety of orange clothing. 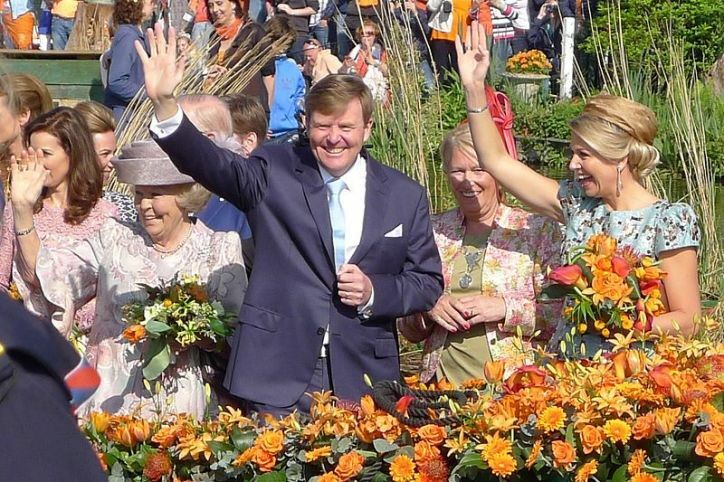 Wearing orange shows support for the royal family and their house – Orange-Nassau. Orange clothing is worn and can display a variety of ‘royal’ symbols from crowns to words like “King” and “Fijne Koningsdag.” Various items are also bought to wear on the day. These usually include funny hats, flower wreaths and glasses to name a few. 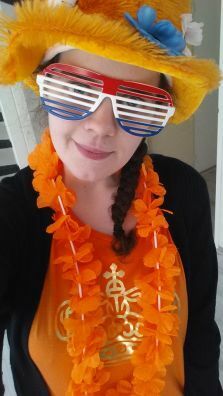 Fun fact – on Koningsdag, people will spend about €25-€26 on Koningsdag attire! Eating orange tompouce is required! An orange tompouce for Koningsdag! 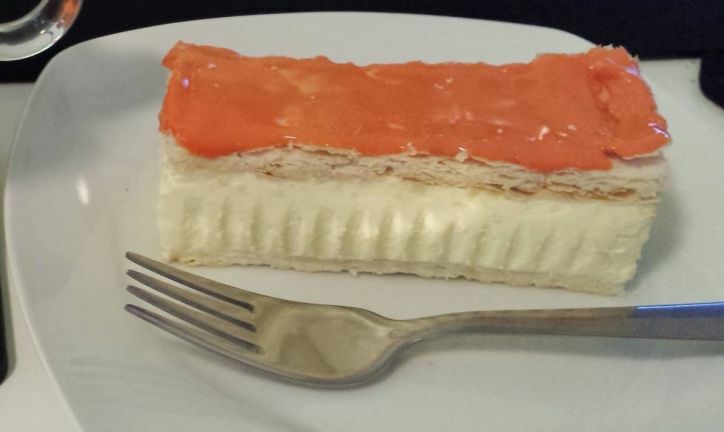 Well.. required may be a bit strict, however it is normal to eat an orange iced tompouce on Koningsdag. Tompouces are little slices of thing pastry with cream in the middle. No one truly knows how to actually eat a tompouce correctly. Just shove it in and hope that the cream does not go everywhere! They are super tasty, or “lekker” in Dutch. I personally would not recommend eating too many of these though because they are super sweet! 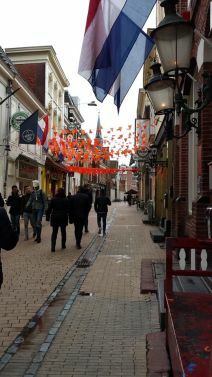 On Koningsdag, it is very traditional for towns and cities to hang up a wide variety of banners and flags for the day. 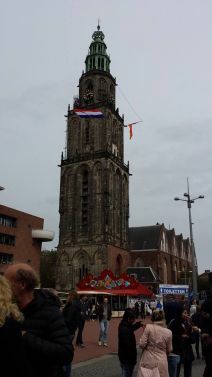 In the Netherlands, it is also normal for people to display the national flag outside their home with either an orange tip on the pole or with a little bit of orange ribbon. This is to honor the King and his house. Music stage ready for the days festivities! Throughout the day (the the previous night, where the festivities begin) there are many parties. These parties will consist of heavy dance music and drinking. I do not partake in this though because I do not drink a lot can I tolerate loud music. Usually these parties last until the early hours of the morning, so good luck if you have work the next day! Do you celebrate Koningsdag? What do you love about the day? Let me know! Couldn’t have explained it better myself. For those who do have work the next day, Dutch bosses are very tolerant the day after koningsdag. Good thing I’m on holiday in Spain atm so I don’t have to worry about that.